This is another of the early Edison kinetoscope movies that was meant to demonstrate what motion picture cameras could do. This was the first known movie to be presented to audiences, and also the first example of actors performing roles on film. This was not an actual shot of a blacksmith shop, it was set up in the Black Maria studio to reproduce one. It establishes the long-running tradition of framing a “stage” in which actors move about, with no camera movement or closeups. 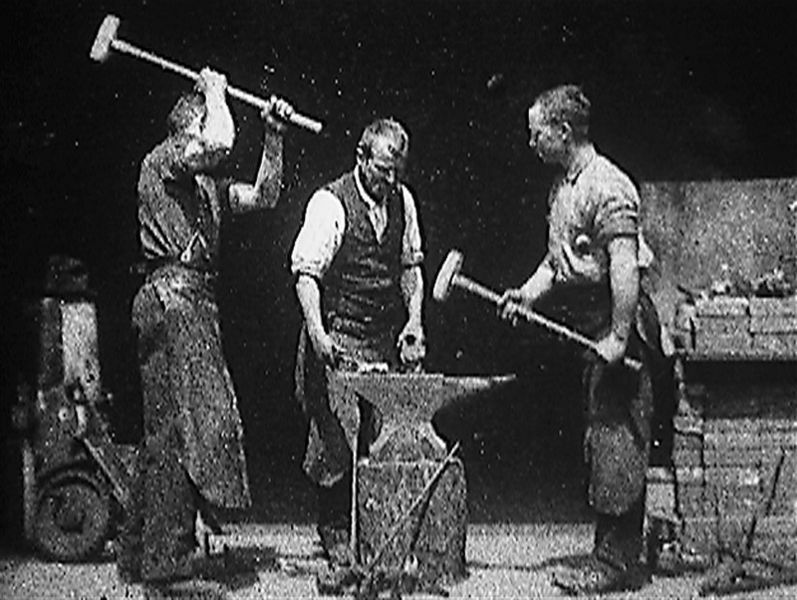 It’s interesting to modern viewers in part because most of us have only seen blacksmiths in movies about earlier eras, but this was not intended as a “period piece;” it’s a depiction of everyday life as the viewers of that time would have recognized it. It’s also surprising to see workers consuming alcohol on the job, around dangerous heavy tools and flame.